To clarify some terms and types of tailored coats, jackets and suits and the differences between all of them, I have written a glossary. The links within the definitions link between different terms in the glossary. 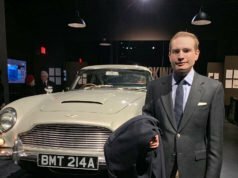 Links that follow a “learn more” link out to examples relevant to James Bond or to other projects by James Bond actors. Balmacaan: An overcoat with raglan sleeves, a Prussian collar, slash pockets and an A-line cut that belts at the waist. Often in tweed or in cotton twill as a raincoat. Learn more about Roger Moore’s balmacaan in The Naked Face. Black lounge: A black or dark grey lounge jacket or double-breasted jacket worn with a matching or contrasting waistcoat and grey striped or check trousers. It takes the conventions of morning dress but replaces the morning coat (cutaway in American English) with a lounge coat. Because of this it is between the formality of morning dress and a lounge suit, and the black lounge jacket will often take the double-breasted peaked lapels that the morning coat usually has. Also called a stroller or Stresemann. Learn more about James Bond’s black lounge attire for his wedding in On Her Majesty’s Secret Service. Black tie: An evening dress code specifying a dinner jacket and black bow tie. Blazer: 1) A boldly striped sports coat worn for boating. 2) A solid-coloured (usually dark blue) jacket with metal buttons. This was originally a double-breasted jacket based on the naval reefer jacket, but later single-breasted versions became commonplace. Learn more about James Bond’s navy blazers. 3) In the 21st century this term has often been used to describe any type of odd jacket or has become a word for tailored jacket. Because casual jackets are more popular than tailored jackets, the traditional term “jacket” has begun to fall out of use for tailored jackets and is commonly replaced by the term “blazer” and the original more specific meaning is being forgotten. Body coat: A fitted knee-length coat cut with a waist seam, large side bodies and a single vent and pleats at the back. It has two buttons decorating the back. The frock coat, morning coat and dress coat are types of body coats. Bridge coat: A military double-breasted greatcoat-style overcoat with 8 buttons in two vertical columns with an ulster collar and slash pockets. Learn more about James Bond’s black bridge coat in Spectre. British warm: A double-breasted military-style greatcoat that fastens with a three buttons in a straight column and has peaked lapels, shoulder straps, set-in pockets and sometimes a half belt in back. It is traditionally made in taupe-coloured heavy melton wool. Business suit: See lounge suit. Car coat: A short outercoat that is easy to wear in a car. Learn more about James Bond’s car coat in On Her Majesty’s Secret Service. Chesterfield: A dressy full-length overcoat in dark melton or herringbone wool. Single-breasted versions have a fly front while double-breasted versions usually fasten with two buttons. It has set-in pockets and may have a velvet collar. Learn more about James Bond’s chesterfield in Dr. No. City suit: A dark lounge suit made in worsted or flannel wool. Country suit: A woollen tweed or flannel lounge suit made in earth tones, often worn for country sports. A sports suit is a variant on the country suit. Coat: An outer garment with sleeves and a fastening down the front. An overcoat is a type of coat that is worn over another coat. A jacket is a type of short coat. An overcoat or a jacket may be called a “coat”. Coating: A heavy cloth suitable for making an outercoat. Cover coat: See covert coat. Covert coat: A lightweight topcoat made in covert cloth, a wool with a steep twill, that traditionally has a fly front, velvet collar, hacking pockets and four lines of stitching at the cuffs and hem. Crombie coat: A three-quarter length topcoat in melton or herringbone wool with a fly front, set-in pockets and a velvet collar. It is named after the brand that popularised the style and is similar to a Chesterfield coat but shorter. Learn more about James Bond’s Crombie-style coat in Spectre. Cutaway: American term for morning coat. Dinner jacket: A lounge jacket or double-breasted jacket made especially for the semi-formal black tie dress code to wear with a white shirt and a black bow tie. It traditionally fastens with one button and comes in black, midnight blue or ivory (only for the tropics, which may also extended to warm locales such as America in the summertime), with other colours made experimentally. In the darker variants it has silk-trimmed lapels and is paired with matching trousers that have a silk stripe or braid down the side of each leg. This suit may be known as a “dinner suit” or “evening suit” in modern usage, but “dinner jacket” may also refer to the whole suit. The ivory variant is paired with the same trousers that are paired with the dark dinner jacket. Americans use the term “dinner jacket” only for the ivory dinner jacket or another dinner jacket that isn’t black or midnight blue and part of a suit. 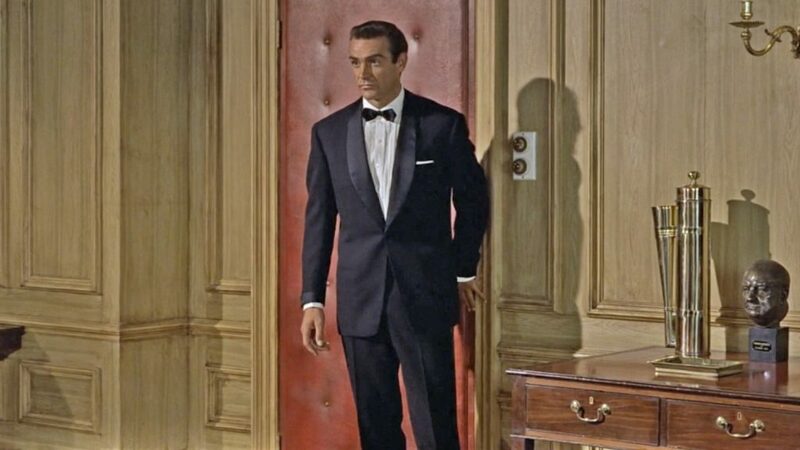 Learn more about James Bond’s dinner jacket style. Dinner suit: A modern term for a matching dinner jacket and trousers. “Dinner jacket” can also be used to describe both the jacket and trousers. Americans call this a “Tuxedo” or “Tux“. Dress coat: A tailcoat that is waist-length at the front and sides and has tails in the back. It is black or midnight blue and has matching trousers with a double-braid at the outseam. It is part of the the white tie dress code and is wore with a white shirt that has a stiff front, stiff detachable collar and single-link cuffs, a white marcella cotton waistcoat and a white marcella cotton bow tie. The dress coat is often known simply as a “tailcoat”. Learn more about Roger Moore’s dress coat in The Saint. Evening suit: See dinner suit. Frock coat: A knee-length body coat with a full front. Originally single-breasted or double-breasted, the double-breasted version was more commonly worn into the 20th century. Full dress: See white tie or dress coat. Guards coat: A military-style double-breasted overcoat that fastens with either two or three buttons and has a half belt at the back and set-in pockets. Learn more about James Bond’s guards coat in Die Another Day. Greatcoat: A long military-style overcoat with set-in pockets that fastens to the collar and has a Prussian collar. Most commonly the greatcoat is double-breasted and fastens with five or six rows of buttons, and the buttons are spaced further apart up the coat. Learn more about James Bond’s greatcoat in Quantum of Solace. Hacking jacket: A sports coat traditionally with slanted “hacking” hip pockets and a deep single vent. 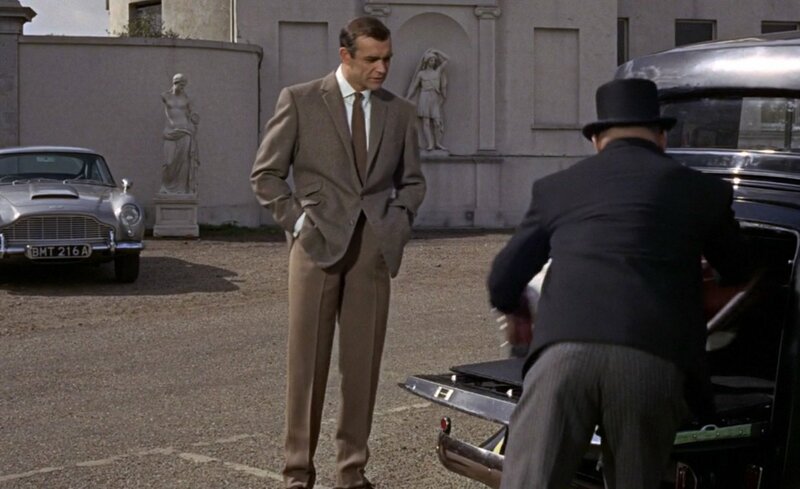 Learn more about James Bond’s tweed hacking jacket in Goldfinger. Half Norfolk jacket: A lounge jacket with features inspired from the Norfolk jacket, such a half-belt in back, bellows pockets and pleats in back. 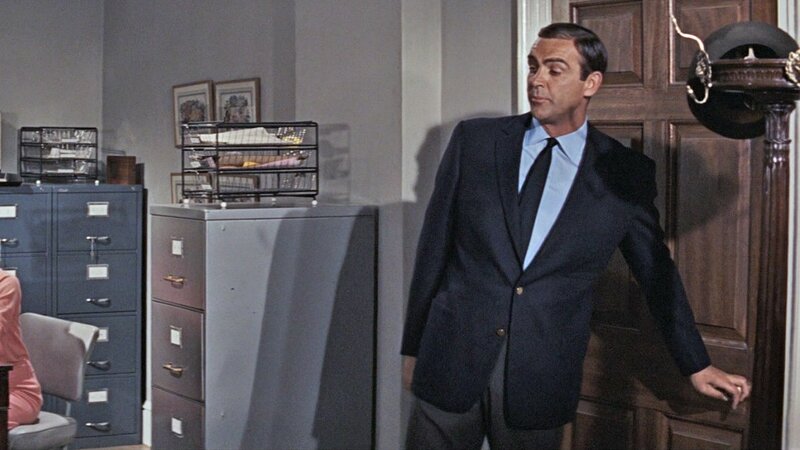 Learn more about James Bond’s herringbone tweed half Norfolk jacket in Diamonds Are Forever. Inverness cape: An outercoat that does not have sleeves but instead armholes and a cape covering the arms. Jacket: A waist-length or hip-length coat. Traditionally used to describe an odd jacket or modified with another to become “suit jacket“, “dinner jacket“, etc. May be called a “coat”. Jacketing: A cloth that an odd jacket is made from, often in a looser weave that would not make up well as trousers. Lounge coat: See lounge jacket. Lounge jacket: A tailored single-breasted jacket. Also called a lounge coat. Lounge suit: A suit made up of matching single-breasted lounge jacket (or double-breasted jacket, in modern usage) and trousers, and sometimes a waistcoat. A suit with a dinner jacket is not called a “lounge suit”. Morning coat: A knee-length tailcoat that is gradually cut away below the waist at the front of the skirt, originally made for horseback riding and now part of the formal morning dress. It is traditionally made in black or dark grey and worn with a pale-coloured waistcoat and grey striped or checked trousers. It may be part of a morning suit, where the morning coat, waistcoat and trousers match in grey. The formal morning coat has one button and peaked lapels, but older versions with more buttons and notched lapels were common for less formal occasions. Learn more about M’s morning coat in A View to a Kill. Morning dress: A daytime dress code specifying a morning coat. Morning suit: A suit of matching morning coat, waistcoat and trousers, traditionally in light to medium-dark grey. Learn more about James Bond’s morning suit in A View to a Kill. Norfolk jacket: A belted sports coat with box pleats on the front and bellows pockets designed for hunting. Traditionally it has four buttons on the front and may be cut with a yoke. Learn more about Roger Moore’s Norfolk jacket in The Persuaders. Odd jacket: A lounge jacket that is not part of a suit. A sports coat is a type of odd jacket, but if the jacket does not have sporting features it is merely an “odd jacket” or a “jacket“. Learn more about James Bond’s odd jackets. Outercoat: A coat meant to be worn outside over other coats. Overcoat: A heavy knee-length or longer outercoat designed to wear over another coat. Pea coat: A hip-length double-breasted coat with a straight cut based on the reefer jacket made of navy or black heavy melton wool. It has broad lapels that can fasten up to a Prussian collar and slash pockets. Unlike other military coats, the pea coat is more casual. Also called a pea jacket or P coat. 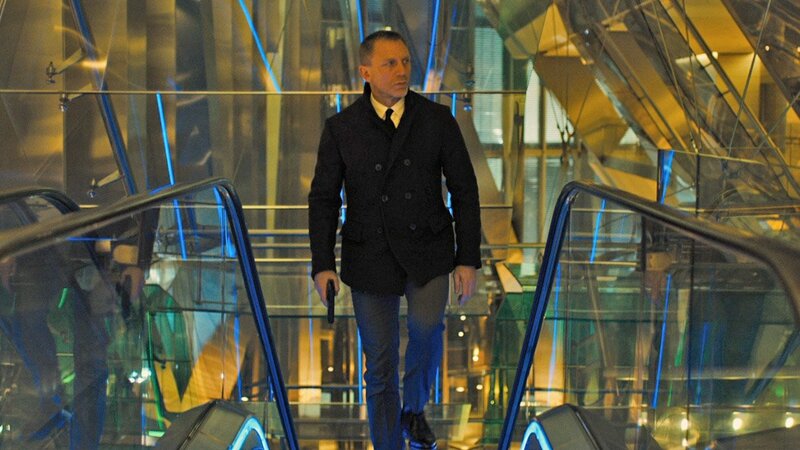 Learn more about James Bond’s pea coat in Skyfall. Pea jacket: See pea coat. Polo coat: A double-breasted coat made of camel hair based on the double-breasted Ulster. It may have either an ulster collar or peaked lapels, and there are six buttons, of which two or three may fasten. It is detailed with a buttoned half-belt in back, flapped patch pockets and turn-back cuffs. Raincoat: A weather-proofed outercoat. Learn more about James Bond’s raincoat in Casino Royale. Reefer coat: See reefer jacket. Reefer jacket: An outdated term for a tailored double-breasted coat/jacket. Also called a reefer coat. Sack suit: American word for “lounge suit“, usually more specifically applied to when the suit jacket is cut without front darts because it resembles a shapeless sack in comparison to more traditional lounge jacket styles. Learn more about Felix Leiter’s sack suit in Goldfinger. Smoking jacket: A tailored jacket of velvet or silk with a shawl collar, traditionally double-breasted, that fastens with fancy toggles. This is a jacket meant to be worn at home. It is derived from the dressing gown and is a precursor to the dinner jacket. Sport coat: See sports coat. Sport jacket: See sports coat. Sports coat: A lounge jacket with sporting features—such as hacking pockets, bellows pockets, deep vents, a throat latch or pleated and belted backs—in a coarse cloth. Also called a sports jacket, a sport coat or a sport jacket. Americans will use any one of these terms to specify any odd jacket. 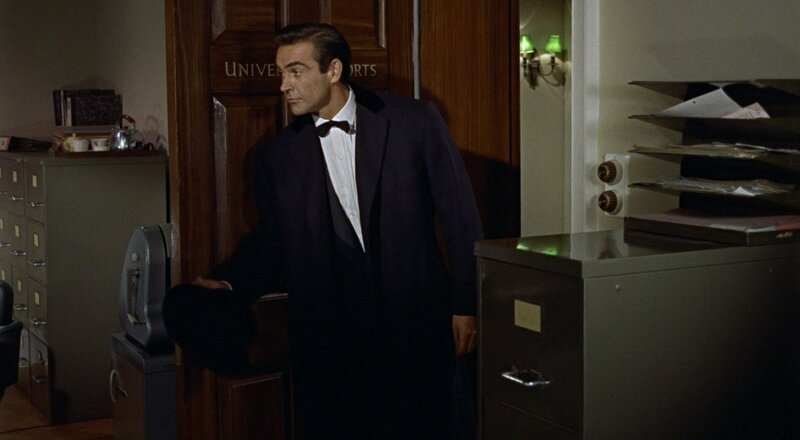 Learn more about James Bond’s sports coats. Sports jacket: See sports coat. Sports suit: A sports coat with matching trousers or breeches. A type of country suit. 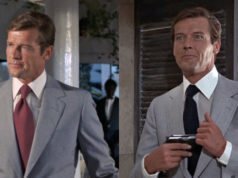 Learn more about James Bond’s donegal tweed sports suit in Moonraker. Stresemann: German term for black lounge. Stroller: American term for black lounge. Suit: A set of matching clothes, usually a single-breasted lounge jacket or double-breasted reefer jacket and trousers. A waistcoat is sometimes added as part of the suit. A morning suit is another type of suit made up of matching morning coat (cutaway in American English), waistcoat and trousers. If a piece of an outfit does not match another, it is not part of a suit. 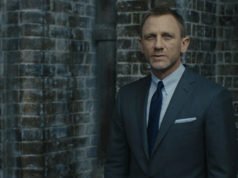 Learn more about what makes James Bond’s suits special. Suit jacket: A jacket that is part of a lounge suit and is worn with matching trousers and sometimes a matching waistcoat. Suiting: 1) The cloth a suit is made from, usually in a tighter weave that would make up well in both a jacket and trousers. Learn more about James Bond’s suitings. 2) Putting someone in a suit. 3) In the 21st century this term has often been used as a collective noun for “suits” in an attempt to sound fancier. Tailcoat: A body coat that is cut away at the front of the skirt below the waist with only the back remaining as “tails”, which reach the knee area. The morning coat and dress coat are types of tailcoats, but “tailcoat” alone is often used to mean “dress coat”. Three-Piece Suit: A lounge suit with matching jacket, waistcoat and trousers. Learn more about James Bond’s three-piece suits. Topcoat: A three-quarter length—ending above the knee—lightweight outercoat. 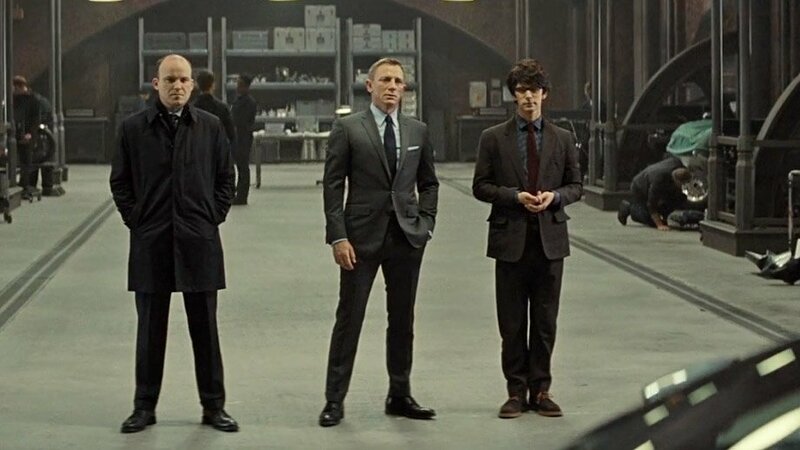 Learn more about James Bond’s topcoat in Skyfall. Trench coat: A double-breasted raincoat—traditionally made of cotton gabardine—that has 10 buttons fastening to the top with an Ulster collar, a storm flap, shoulder straps, vertical flapped pockets and a belted waist. Learn more about Roger Moore’s tan cotton trench coat in Happy Anniversary 007. Tuxedo: 1) American term for dinner suit. 2) Sometimes it is used to describe an ivory dinner jacket outside of America. 3) In the 21st century in America the term is often improperly used to describe any outfit fancier than a regular lounge suit in any colour, including tailcoats or lounge suits with unusual trim. Americans may also use it to describe any hired (rented) outfit, even if the outfit is an ordinary lounge suit. Tux: An informal American word for “Tuxedo“. Two-Piece Suit: A lounge suit with matching jacket and trousers. Ulster: 1) The original Ulster is a single-breasted knee-length overcoat that buttons to the top with a Prussian collar and has an attached cape. Learn more about James Bond’s Ulster in On Her Majesty’s Secret Service. 2) The modern Ulster is a double-breasted coat, often of tweed, that usually fastens with three buttons and has an Ulster collar. The Ulster collar is a broad collar that can fasten to the top. This Ulster coat has a belted back and turn-back cuffs. White tie: An evening dress code specifying a dress coat and white bow tie. In England, most decent tailors refer to the suit “jacket” as a “coat”, not jacket, hence the sewing tailors are trouser makers or coat makers, never jacket makers. All jackets are coats and may be called “coats”, but not the other way around. can suit coat be made into a blazer or a dinner jacket for that matter? I say no. and, is advisable that a two button suit jacket be made into a three button suit jacket by actually cutting the lapel? A suit coat of navy serge could be made into a blazer by changing the buttons. Otherwise no, since blazers are usually made of different types of cloths than suits are. If a suit were made of the right kind of wool for a dinner jacket, perhaps a midnight blue or black wool/mohair blend, then it might be possible. Dinner jackets are usually made of barrathea wool, which suits are not made of. Sometimes a button two can be made into a button three, but the lapel roll will always be at the same place. Hey! You explained very well in your post. But tell me one thing, is suit can be called as a blazer ? Blazers and suits are completely separate in almost all scenarios.